Dress up for a Casino party or hand out fun casino apparel to your guests as soon as they arrive at your party. We carry a good selection of casino theme apparel from hats, to beads , and casino dealer vests. Use a Plastic Dealer Visor and a Dealer's Arm Band to dress up like a casino dealer and greet your guests. If you want to look like a player at the casino check out our Card Suit Suspenders, and Plastic Dealer Visor. Then you can accest with some different party beads. Or maybe you want a whole outfit already together, then our Adult Female Casino Costume is perfect for you! The red color with the dice accent will look great with the rest of the Casino or Poker decorations. Create your own casino theme costume with our selection of great casino apparel. Or you can even create a fun casino costume with our products to sport at Halloween! Whatever you are looking to wear your casino apparel for check out our great products! Throw a casino party and really get into it by dressing up. We have casino apparel and costumes for the hosts and the guests of the party. 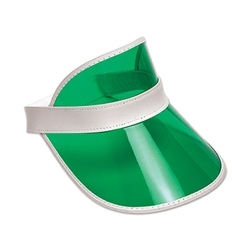 We have dealer's arm bands and dealer's visor's to let your guests know that you are serious about taking their money. Give each of your guests a "$" Beaded Necklace or some Jackpot Beads to make them feel like a real winner. We have several different Casino theme hats including the Casino Night Hi-Hat and the White Hi-Hat with gold band to make you look like a high roller. We have a Red Barbershop Quartet Vest and skimmer hat that will make your outfit complete. However you want to dress up for your Casino party, we have what you need including spades shaped glasses. Casino beads are very popular with casino parties either as welcome gifts or as prizes for blackjack mini-tournaments. Check out the Beaded Poker Chip Necklace and the Casino Dice Beads Necklace. However you decided to dress for your casino theme party we hope we are invited.